Hair Products that we use at The Golden Razor Barber Shop our carefully chosen. We take pride in the thoughtful selection of brands and the lines they offer because we know from years of experience, that the right cut and the right product can make your hair look great! The hair products listed below have proven to work really well with our clients. We hand-select only the items from each brand we know you’re going to love and make a difference in how you manage your hair after a cut from us. All of our products are priced very competitively! So not only are you choosing some of the best hair products on the market, it’s easy on your budget too! Dandruff formula to control flaking. This refreshing dandruff shampoo cleanses thoroughly and leaves your scalp feeling rejuvenated. Controls flaking while adding body and shine. Adds body and thickness to fine, limp or thinning hair. This acid balanced shampoo is filled with bodifying proteins that will leave your fine, limp or thinning hair looking full and thick. Mild cleansing formula for dry, damaged or chemically treated hair. This gentle cleansing shampoo is enriched with protein and moisture and will not strip hair-color. 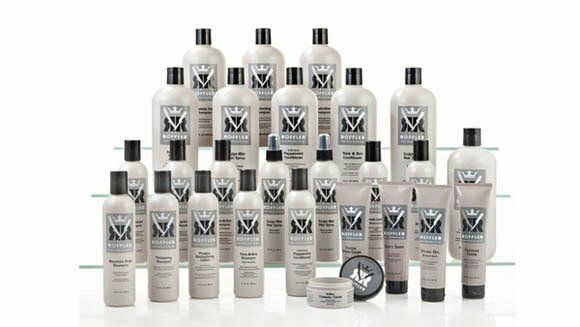 Specifically formulated for the treatment of dry, damaged and/or chemically treated hair. Blue Formula is for use on dark brown or black hair. This deep cleansing formula cleanses the hair and scalp thoroughly while controlling excess oil secretion, can also be used for the removal of mineral or styling aid build up. Gold Formula is for use on light brown, red or blonde hair. This deep cleansing formula cleanses the hair and scalp thoroughly while controlling excess oil secretion, and can also be used for the removal of mineral or styling aid build up. Daily shampoo adds brightness to gray and white hair. Natural emollients soften gray hair and provide unmatched volume and shine. Silver Shampoo removes yellow cast and adds brightness to gray or white hair without build-up. Daily conditioner for moisturizing and restructuring the hair. This advanced formula combines a unique blend of ingredients designed to de-tangle, moisturize and restructure the hair leaving it soft and shiny. A moisturizing complex with Panthenol prevents moisture loss and protects hair. Shapes and forms hair to desired sculptured look. Formulated to provide maximum hold without flaking or feeling sticky. For a wet look, apply Sculpt Glaze and allow hair to dry naturally. Blow dry hair for a soft natural look with shine. Soft hold with light leave-in conditioning properties for fine hair. A combination conditioner and styling tool that gives volume, body and shine to fine, thinning or damaged hair. Complex proteins replenish body and offer maximum protection from thermal styling. Quick drying gel that will not flake. Styling Gel is a medium hold gel that dries quickly and will not flake. It is enriched with Aloe Vera that provides natural conditioning and moisturizing making it a great choice for unruly hair. Body, control and shine for damaged hair. Enriched with proteins. Finishing Cream conditions while providing body, control and shine. The styling solution for dry, damaged hair. Firm hold adds texture and shine. Create maximum control and body on all hair types. Roffler Styling Mousse adds texture and shine without stickiness, and the light, foamy application helps eliminate tangles, while leaving hair soft and manageable. This protein conditioning formula dries fast and creates body, texture and shine. Formulated for hairstyles that require a medium to strong hold. This protein conditioning formula dries fast and creates body, texture and shine. Formulated for hairstyles that require a light to medium hold. With maximum style retention: Spike It, Slick It, Make It Stay Put! The ultimate in super holding power, mega firm, and designed to hold all day. Adds shine, non-flaking, quick drying formula for all hair types. 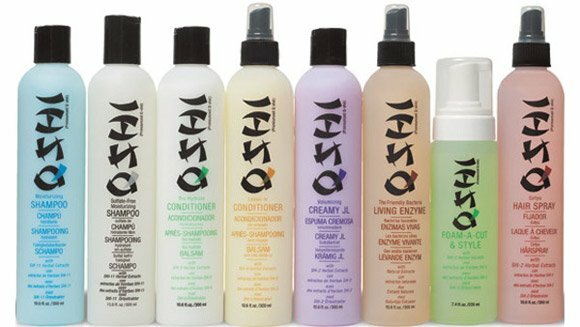 QSHI – (pronounced Q-she) Products are formulated with the finest herbal ingredients which helps promote healthy, shiny hair. The use of these herbs leaves you and your hair feeling relaxed, refreshed and revitalized. These products are manufactured by AMM, a division of OnRite. QSHI – Moisturizing Shampoo – To cleanse and moisturize normal to dry hair. Also works well on permed or processed hair. Made with SHI-11 Herbal Extracts. Promotes a clean, healthy look. QSHI – Leave-In Conditioner – To condition, detangle and add shine. Formulated with SHI-9 herbal extracts to instantly condition the hair. It can be used as a pre-wrap for perms before chemical services. Protects hair from damage caused by styling. QSHI – Foam-A-Cut and Style – A light to medium hold, protein rich and alcohol free styling tool which is a foaming mousse. Made with a special blend of exclusive QSHI SHI-3 herbal extracts, Foam-a-Cut keeps hair moist while cutting and protects hair from heat while styling. QSHI – Gotyu Hair Spray – A firm hold finishing spray. Fast drying, never sticky, and style leaves no build-up. A special high performance formulation with SHI-2 herbal extracts. This hair spray is designed to hold the finished style without build-up. Fast drying, non-flaking! QSHI – Bio-Hydrate Moisturizing Conditioner – A natural conditioner-guarantees moisture to skin and hair. A high performance re-constructor made with SHI-9 herbal extracts with Botanicals and Aloe Vera to instantly condition, detangle, hydrate and add shine to dry or porous hair. For dry to normal hair. QSHI – Living Enzyme – Removes topical build-up. Excellent to use on the back bar before chemical services such as perms, bleach, color, and relaxers. QSHI luxury enzymes are high activated, non-pathogenic bacterial cultures that have the ability to digest compounds. QSHI – Volumizing Creamy – For normal to dry hair. Made with SHI-2 herbal extracts, QSHI Volumizing Creamy JL is a versatile styling product that shapes and molds hair to perfection. Dries quickly without tackiness or flaking. Use for scrunching, flat tops, spiking, or freezing. QSHI – Get FX Styling Taffy – For texture and control Use QSHI Gel FX for texture, definition, mat look, flat tops, shine, control, and body. Simply work a small amount through damp or dry hair and style, mold, or shape as desired.